Yarrow (Achillea spp. ), also known as milfoil, is one of the easiest and most rewarding wildflowers to grow. It is a tough, long-lived perennial that blooms over and over throughout the growing season. Yarrow has bright green foliage about six inches tall that resembles tiny fern fronds. The plants spread by short underground runners and under ideal conditions it will grow into continuous carpet over a large area. 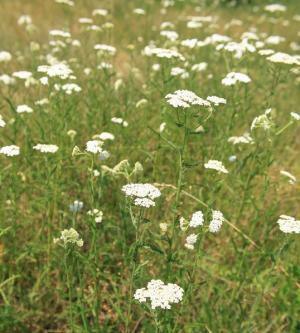 Yarrow is hardy in USDA zones 3-9. The three- to four-inch flowers are shaped like a flattened dome and rise one to two feet above the foliage on leafy stems. The basic species has white flowers though numerous more colorful cultivars have been developed. Milfoil thrives in full sun, though partial shade is also acceptable, and has modest moisture and nutrient requirements. Rich topsoil and regular irrigation will produce lush growth though yarrow grows in almost any type of soil as long as it is reasonably well-drained. It is extremely drought tolerant though it may die back to its roots if water is withheld for too long. Yarrow's spreading nature make it suitable as a groundcover. This is especially true with the basic white variety; the hybrid varieties don't spread as vigorously and have a more upright growth habit. Yarrow has even been used as a grass alternative, as the foliage has a very uniform appearance, accepts mowing, and is fairly tolerant of foot traffic. Yarrow is useful in wildflower plantings, in perennial border, cottage gardens and as edging along pathways. It is one of the best species for attracting butterflies. Milfoil is easy to grow from seed in its final spot in the landscape or in flats of potting soil. The seed is tiny and requires light to germinate, so it's best to spread it on the surface of the soil and simply press it into place rather than cover it. It can be purchased in groundcover flats or in individual pots. Plant plugs eight inches apart for use as a groundcover or place larger potted specimens 18 inches apart in flower borders. Yarrow is a widely available plant throughout the country, in both seed packets and potted form. Yarrow is virtually immune to pests and disease and requires astonishingly little care overall. 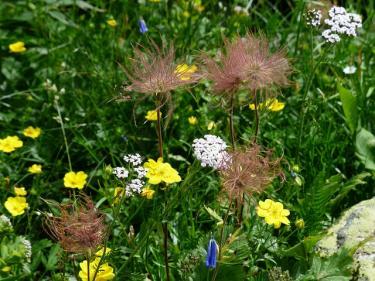 The flower stalks can be clipped to the base as the blossoms fade and the foliage can be cut to within a couple inches of the ground in late fall to clear out the dead leaves. Large patches can be mowed several times a year to keep them looking fresh and uniform. 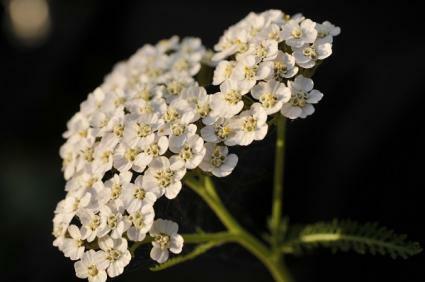 Yarrow flowers can be harvested just as they open for a long-lasting cut flower. Use the basic white-flowering yarrow for medicinal uses, rather than rather colorful cultivars. The leaves are used in herbal teas and for a variety of medicinal purposes though its best to harvest them early in the growing season when they are lush and green for these purposes. Cutting the flowers and leaves is always best to avoid injuring the plant. Leaves can be used fresh on an as-needed basis or dried and stored for times when the freshest material isn't available. The various ornamental cultivars of yarrow differ mainly in flower color. All the varieties below are hardy in USDA zones 3-9. 'Red Velvet' has cerise-colored blooms. 'Strawberry Seduction' has red flowers flecked with yellow. 'Terra Cotta' has multi-colored blooms that start out peach-colored and fade to a burnt orange. 'Moonshine' bears flowers in a pale yellow color. 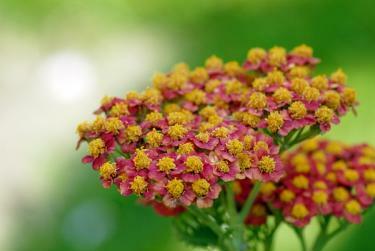 Yarrow is one of the most reliable perennials. Once you have a patch, you can keep dividing it and transplanting it to other bare areas of the garden. The crushed leaves have a delicious fragrance and are known to possess a number of medicinal properties like working as an astringent and aiding blood clotting.